Daryl - I tried Olde Eynsford 1 1/2F in the .360, and there was not enough case capacity to get sufficient velocity to regulate the double. The 2F had enough oomph to get the job done. This is not a problem in a single shot, though. If you don't mind, please share your loads. I have a Lancaster DR and a Henry in 360 and am always looking for different loads. my rifle is not an English .360 but a Germanic 9,3 mm. So I use different bullets. Cases are DWM 9,3x72R, trimmed and necks turned. With Haendler & Natermann 193 grain swaged lead bullets, I also used SR4759, velocities 400-450 m/s. More details via PM if you don´t mind. I’ve noticed that with the Old Eynsford Powder. The 1-1/2F is much more coarse than the 2F. So much so that I’ve not tried the 2F in any of my big cartridges. Hey Mike - I figured Swiss 1 1/2F might be about the duplicate of Enysford 2F and that 2F Swiss might be a bot too "fine" for the job. 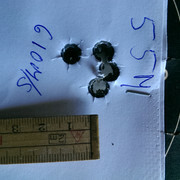 In my .50/95, 78gr. of 3F GOEX was only 70fps faster than 85gr. 1 1/2F Swiss, using the same 368gr. FN bullet. Both powders were loaded to the same volume, thus 85gr. Swiss 1 1/2F took up the same space as 78gr. 3F GOEX. Thus, Swiss BP is much more dense than GOEX, which should be close or the same density wise, to Old Enysford?? I do not know if this is so, or not. I did not have any 2F SWISS to test in my .50/95, but figured likely the same velocity as 3F GOEX, thinking perhaps the 2F Swiss might be faster than desired. Swiss brand powder should be easier to obtain, in Denmark. 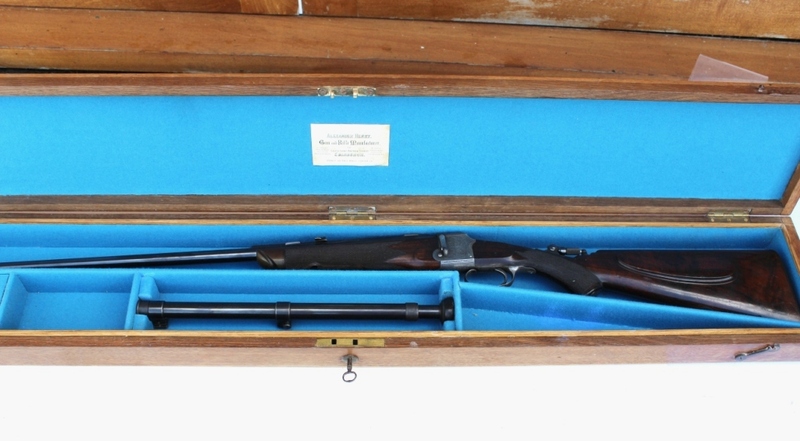 Magnificent Fraser quality....I too wonder why you describe it as a Rook Rifle??? Fraser's falling blocks came in two sizes (pretty sure anyway), one for regular cartridges up to .500 BPE or 500 based cartridges and another smaller sized action usually reserved for rook cartridges. The size difference between the two is substantial. 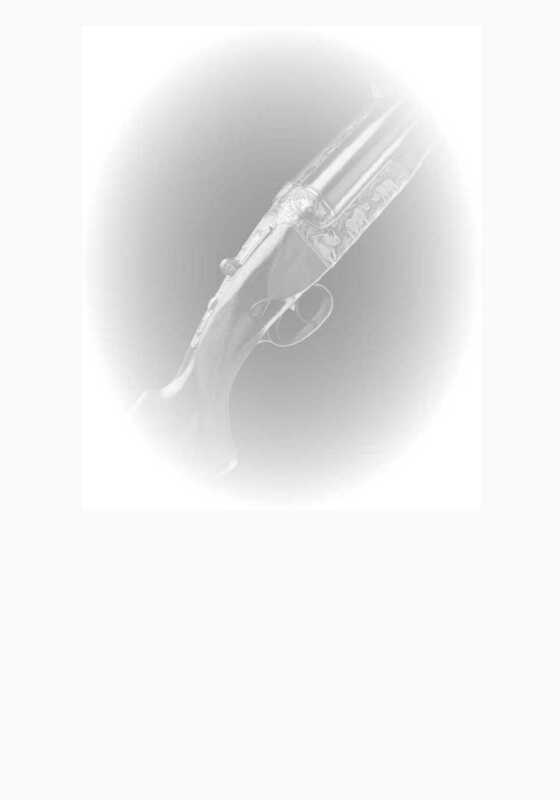 That is why I expressed such concern in shooting a 360 nitro load in such a dainty action. Now, to the rifle at hand, size wise, it is of rook rifle configuration but is chambered in a cartridge more suitable for small deer and larger small game. Something more akin to what was referred to as a "Park Rifle" from the muzzle loading era meaning a rifle used for small deer in a deer park. My understanding of that is that the very wealthy and royalty reserved land on their estates for that particular use. I agree - although did not know the "size" differences, the chambering did not fit rook or rabbit shooting. It is exceting with all those new info! I have now got some help to develop a load for the rifle. I got an very experienced reloader who have done lots of nitro for BP loads. He has made a load with S&B .366 193 grain bullets. I would like to upload some pictures - is there free alternative to Photobucket? I have also decided together with the gunsmith to put on another scope than the Pecar, and some more small changes to the restoration. This is the test load at 55 meters. The one at 100 meters is pretty much the same grouping. They are shoot with scope at 4x magnification. I'm happy with that. can you add in all the details of your load(s) please - for later reference.